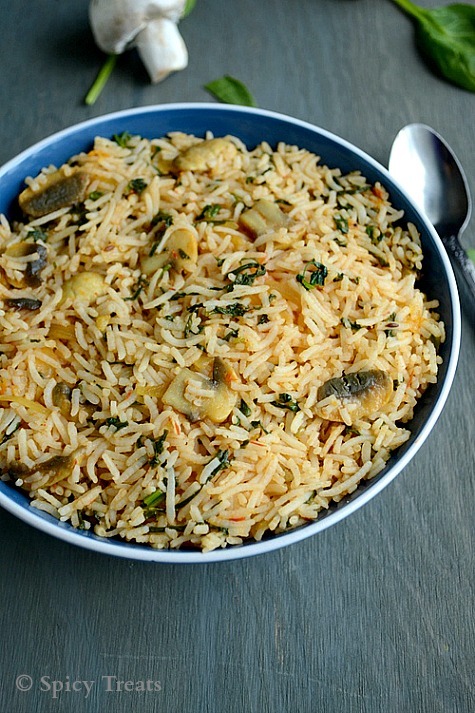 Mild spicy and very aromatic rice that you can make it in a jiffy. 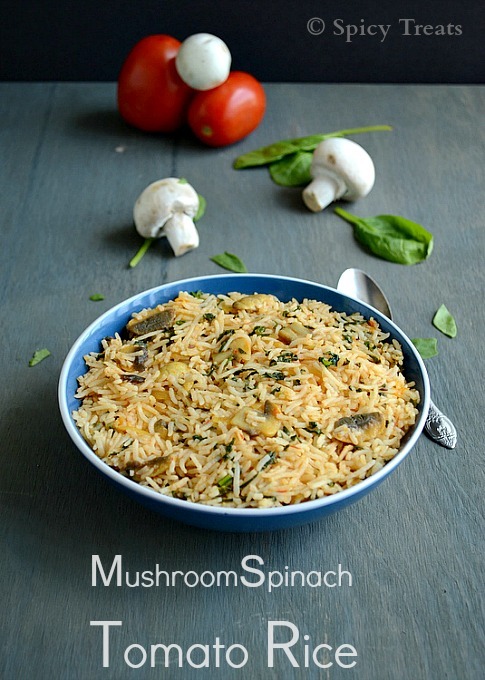 Usual Tomato rice made healthy with the addition of Spinach and Mushroom. So filling and delicious rice perfect for lunch box. This rice does not require any fancy spices just simple available ingredients in your pantry. Good to pack for your lunch box on busy/hurry morning with all the healthy stuff in one pot meal that too in less time. And also this rice no need of any special side dish, simple raita or beaten curd / pickle/chips is enough. Interesting na? give it a try and let me know how you liked it. Then cook rice along with enough water,few drops of oil and 2 cardamom (whole) till done and allow the cooked rice to cool down completely ..(spread in a wide vessel). Heat oil in a sauce pan,add the tempering items and alllow to splutter n then add the finely chopped garlic,fry lightly. Now add the sliced onions and slitter green chillies and saute till onion turns translucent and add the tomato paste. Saute the onion tomato mixture till the tomato paste get fried well, then add the sliced mushroom and dry powders and fry for 1-2 minutes. After that add yoghurt and fry for another 1-2 minutes and lastly add chopped spinach,enough salt and stir fry for 2-3 minutes. (if necessary sprinkle water ) and turn off the stove. Now the mushroom spinach tomato gravy is ready to mix with the cooked rice. Mix everything well without breaking the rice...tats it..ready to pack with some potato chips. Healthy Recipe. Different twist adding both spinach and mushroom. Flavourful n healthy rice!! looks very delicious,liked the addition of spinach.. This looks great, lovely dish. 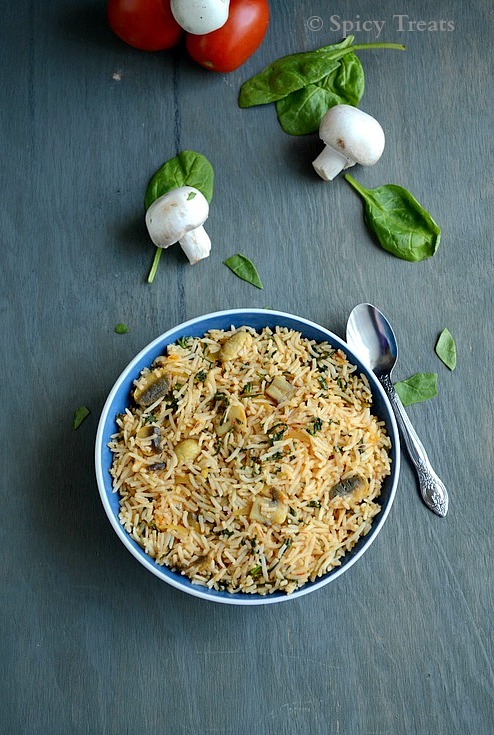 rice is looking great dear..mushroom and spinach make a good combo..colourful and flavourful rice. Thats a fabulous,healthy and filling rice, wat an excellent combo.. Healthy and wonderful dish Sangee. 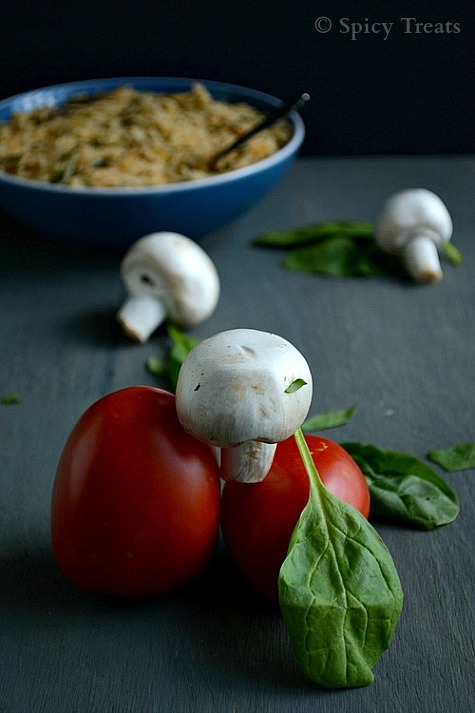 Love the combination of mushroom and spinach. Bookmarked. Thanks for linking it to my event. Very healthy and tasty rice preparation. This's is such a yummy looking one-pot meal! And healthy too! This sounds so easy,yummy and healthy I love such dishes. really yummy looking rice!!! drools! Looks good what does the comment 2 no. mean next to the tomatoes? 2 no. means 2 numbers..puree or paste two tomatoes..